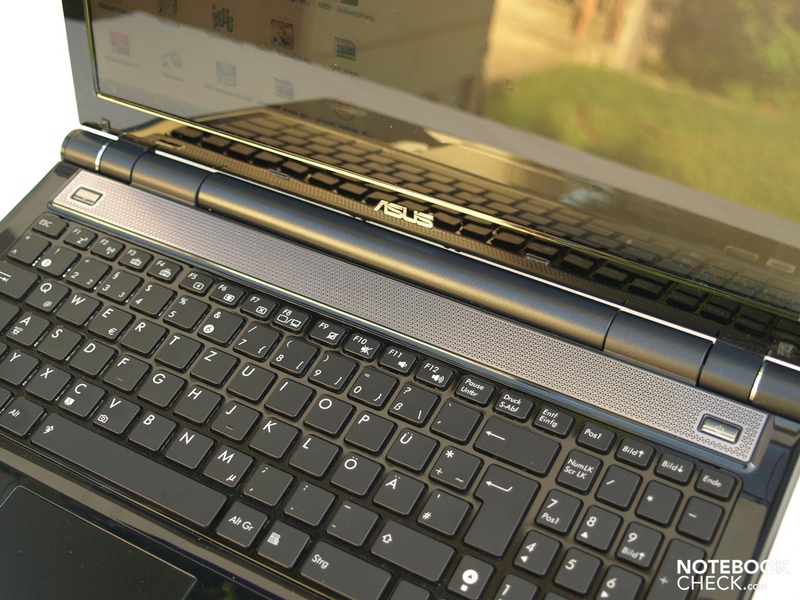 The butterfly has, according to the Asus homepage, significantly influenced the design of the U50 series. 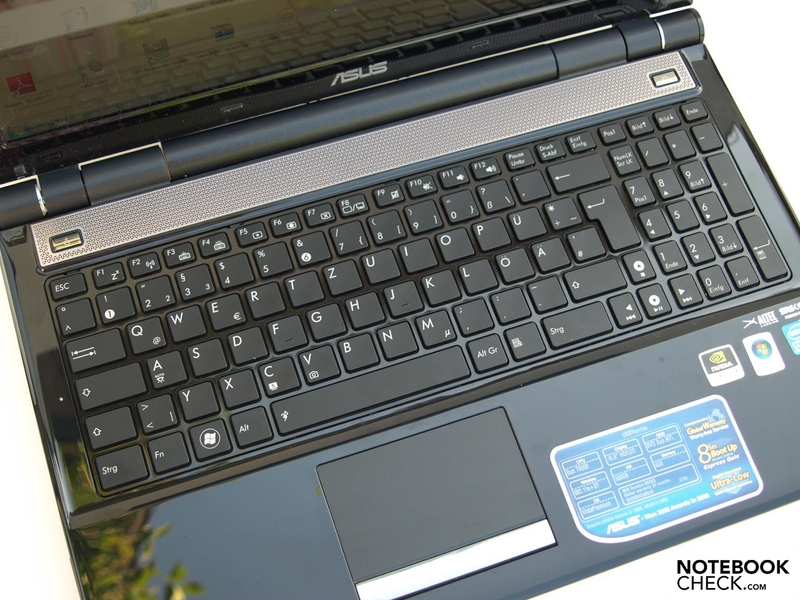 With the U50Vg Asus fields a dazzling notebook in the 15.6-inch form factor. 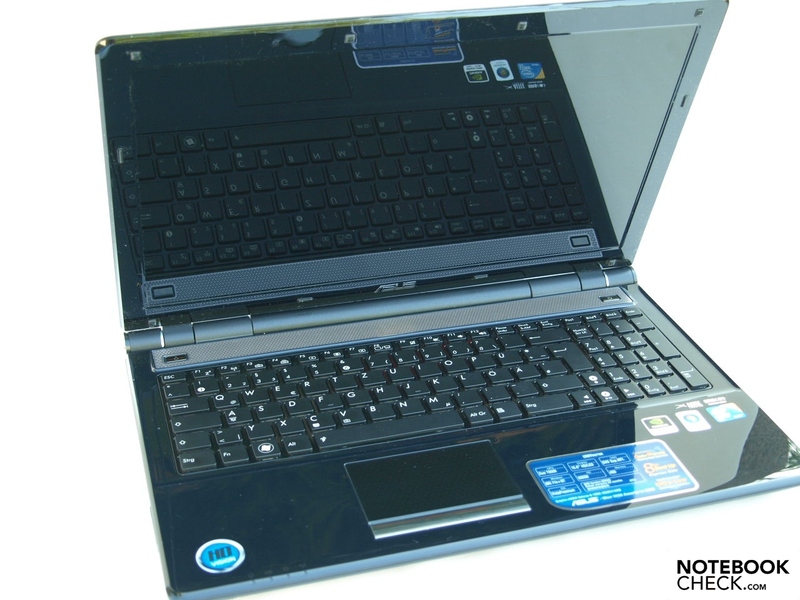 An Intel Core 2 Duo T6500 CPU, a Nvidia Geforce G 105M graphics card and four gigabytes of main memory provide not only a solid office performance but also allow you to play the odd not-too-demanding game and work with light multimedia work. Read further to find out how the U50Vg satisfies our test criteria. 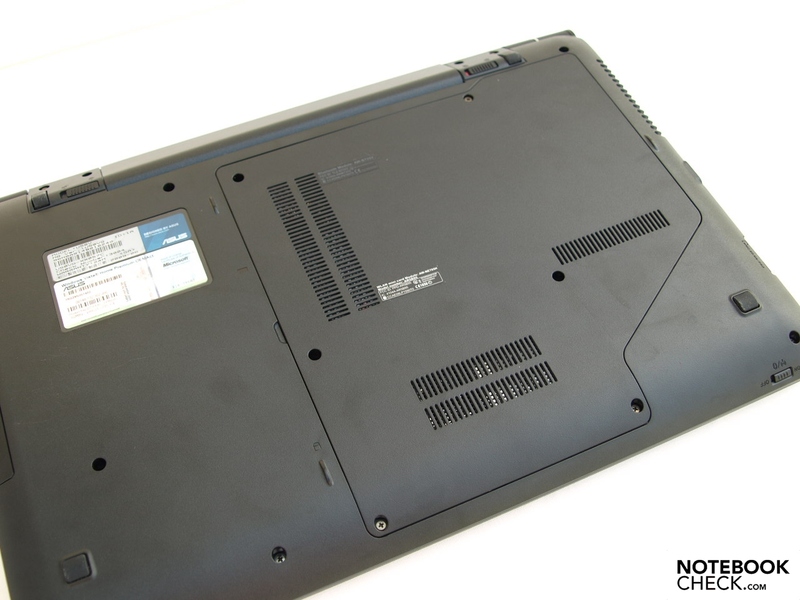 Note: The Asus U50Vg is partly configurable. Therefore other models can differ from the test model in terms of equipment and for this reason performance attributes, emissions and battery life. In the review there was the U50Vg-XX057C. In essence, the U50Vg is presented on first look indoors in black-in-black. In corresponding light exposure, however, for example sunshine, you can ascertain that the black-coloured high gloss surfaces actually glisten. Alongside the not optimal feel of the glossy palm rests, you can establish in the hot season that this as well as the touchpad will get fairly hot when exposed to sunlight. In addition to the glossy display the characteristic of plastic surfaces also limits the desire for mobile use, for example in the garden. A further disadvantage of the high-gloss surfaces is their susceptibility to dirt. In this way, from normal handling fingerprints aplenty collect on the device. The "wings of a butterfly", should be recognised in the shape. It's however a false conclusion that the notebook is as light as a butterfly, however. At around 2.5 kg it is in any case heavier than the design pretends. Apart from a commonly seen weakness in the area of the optical drive, the stability of the base unit turns out to be to our satisfaction. Indeed this creaks somewhat when picking the device up one-handed from a corner, yet visual distortions couldn't be seen. Likewise the loudspeaker covers and the palm rests only slightly give way under stronger selective pressure. The same goes for the maintenance cover on the underside. In practical use no limitations should arise. The display lid is on the whole less resistant to warping, but is quite pressure resistant. The battery has slight play and can therefore slightly wiggle. 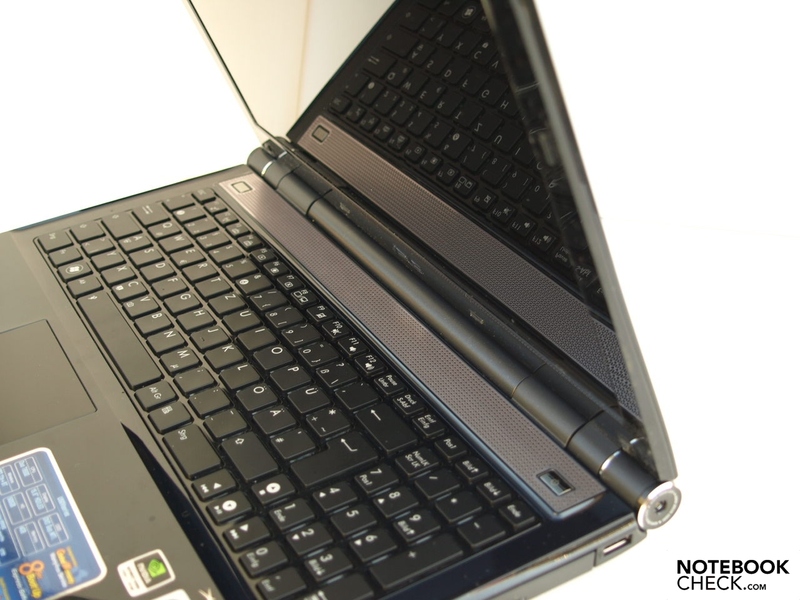 The cylindrical composition of the hinges is strongly evocative of the already tested Sony Vaio notebooks, or maybe of the body of a butterfly, to which both of the wings, display and base unit are attached. They are neither strong enough to prevent a see-sawing after adjusting the opening angle, nor can they sufficiently support each user-defined position. 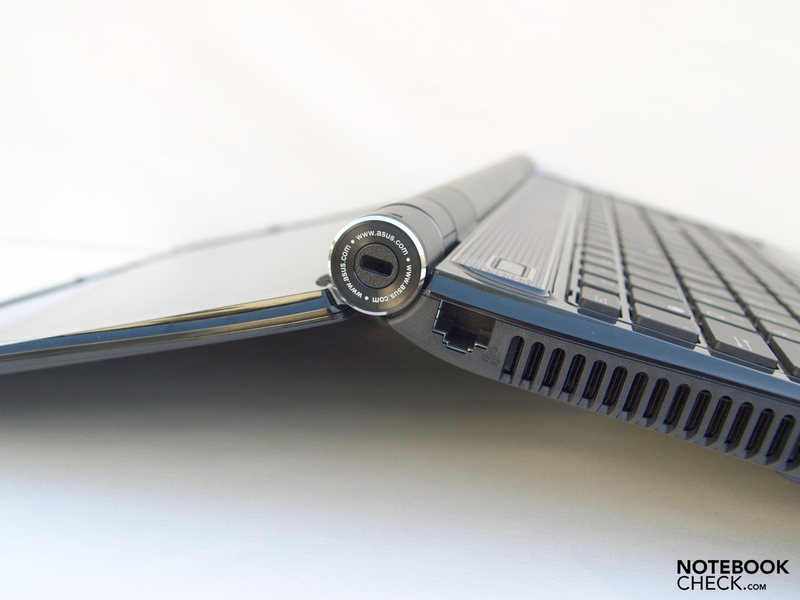 In this way picking up the opened notebook depending on opening angle and applied oomph can possibly lead to a complete opening of the notebook. Speaking of opening angle: more than 180 degress are possible. When going below a certain opening angle the notebook shuts itself. Perhaps due to design reasons a transport catch is done without. Therefore it's advisable to protect the notebook from foreign bodies when it's being transported in its own case in the gap between the keyboard and display. Once again the rear, due to the battery and the opening mechanism, and the slanted front are not used to house interfaces. Nevertheless you will find a rather usable feature quite hidden on the downwards shifting side of the leading edge: The WiFi switch. Likewise in the left area of the front rather small status-LEDs are placed. Their rather tiny, low-contrast inscription is not particularly easy to read. Overall the U50Vg indeed offers three USB 2.0 interfaces, yet there is no pair arranged next to each other, so that use of peripherals with a high energy requirement is problematic. Also for example some USB modems for UMTS gateway to the internet preferably require two USB 2.0 interfaces arranged next to each other. Fortunately the right side also offers an eSATA connection, so that you can run an external mass storage device with better data transfer rates. On the left next to the standard VGA connector you'll also find an HDMI connector for fully digital sound and image transmission to an external device. An 8-in-1 card reader allows use of flash cards of the following formats: SD, MMC, MS, MS-Pro, xD,mini SD with adapter, MS-Duo, MS-Pro Duo via adapter. 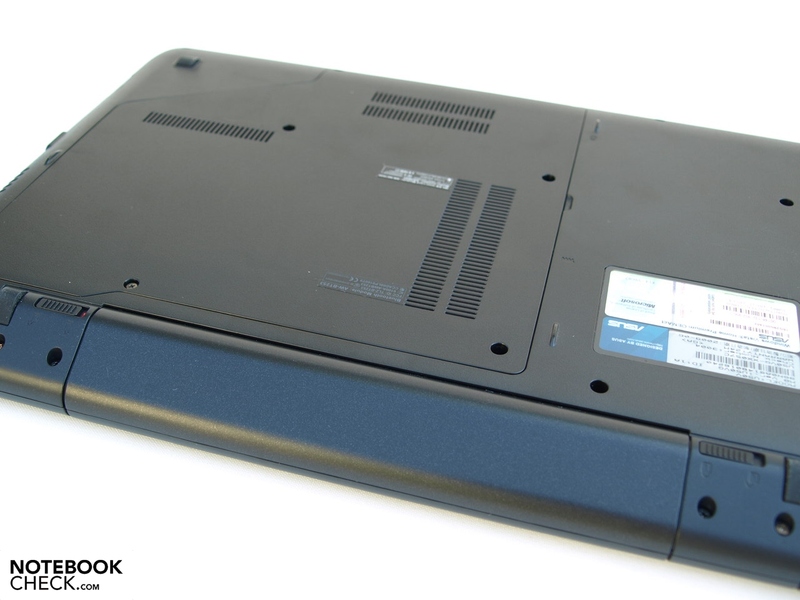 Via the ExpressCard/34 slot you can upgrade the device with further functionality. Due to the aforementioned limitation regarding the arrangement and number of USB ports it would for this reason be more reasonable to retrofit UMTS by the ExpressCard if required. You can draw up a wired LAN connection with the built-in Atheros AR8131 PCI-E Gigabit Ethernet controller (10MBit). 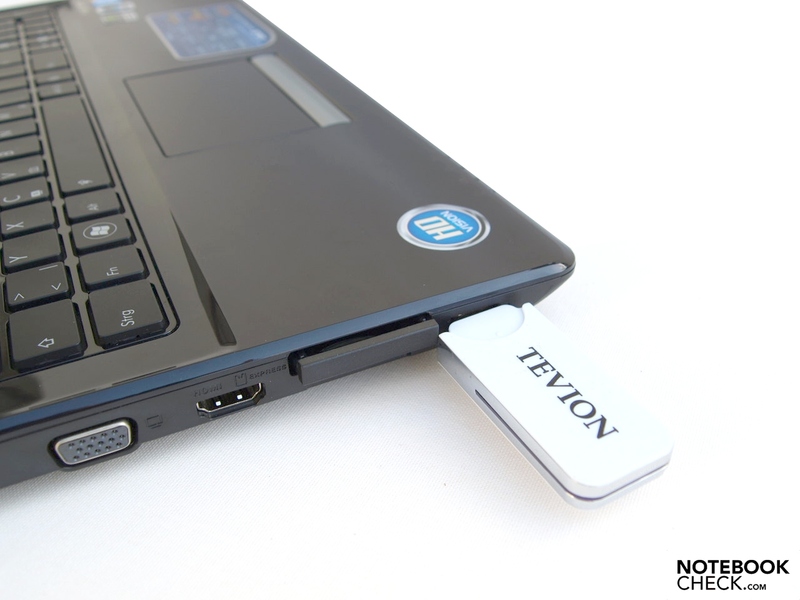 When it comes to wireless WLAN communication an Atheros AR9285 Wireless Network Adapter (bg) takes care of it. Also Bluetooth V2.1+EDR is on board. UMTS on the other hand can if required be retrofitted either with a USB modem (see limitations from the port arrangements) or better still through the ExpressCard/34. On the upper display borders a 1.3 MP Webcam is built in. 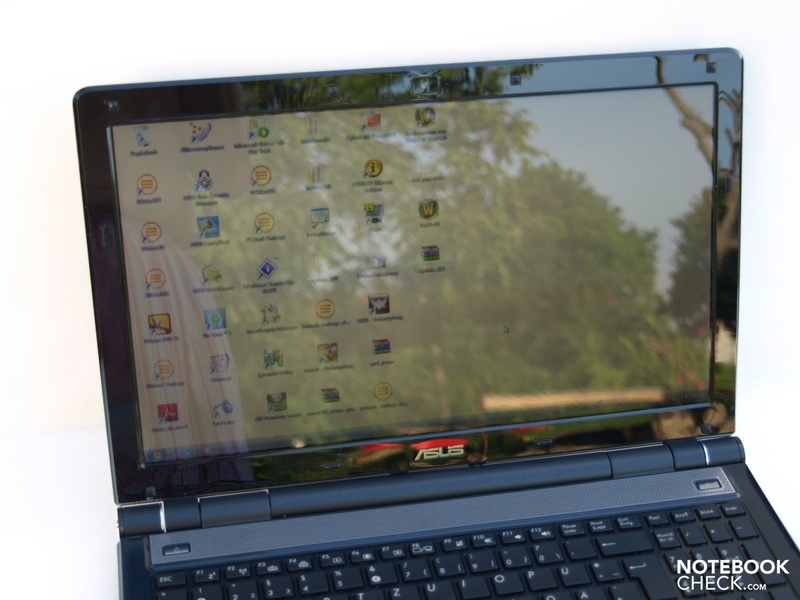 For this reason the Asus U50Vg is for example primed for video-telephony over the internet. 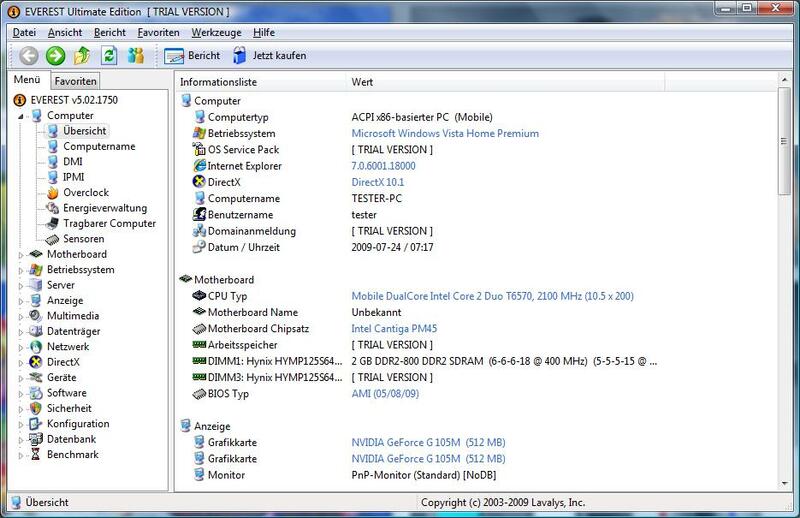 As for operating system, Windows Vista Home Premium 32-Bit was pre-installed. Due to technical limitations only around three Gigabytes of main memory are available for application data out of the four Gigabytes of physical RAM. A recovery DVD and an optical data medium were enclosed. Conveniently the AI recovery burner additionally offers the possibility to produce recovery DVDs from the installed system. 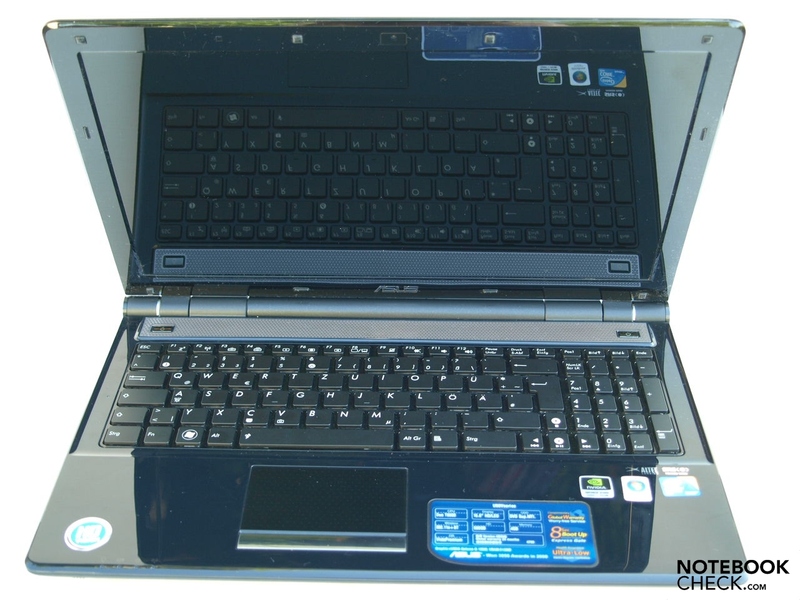 Furthermore from pressing F9 when booting and via the choice from Windows Setup you can restore the system from a hidden partition to its out-of-the-box condition. 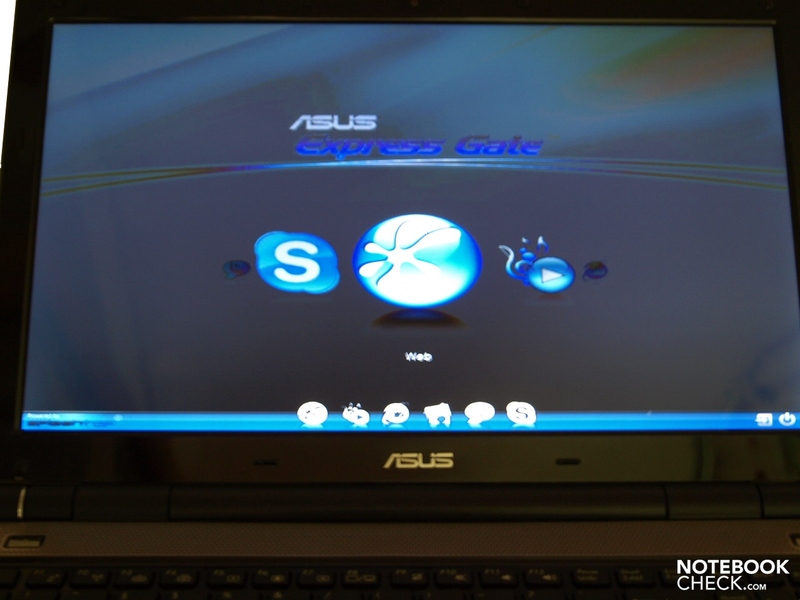 For quick access to the internet without having to boot up the operating system, an instant-on operating system, called Express Gate by Asus, is pre-installed. 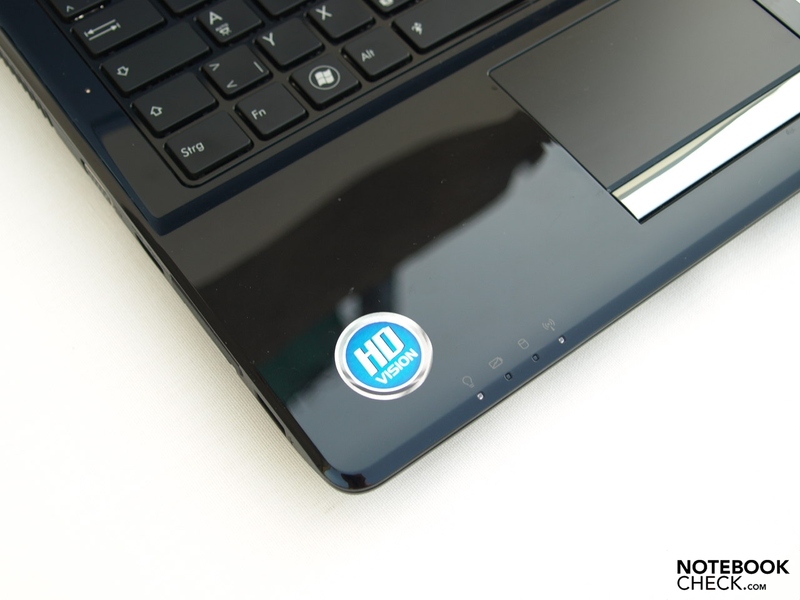 For this reason without having to boot Vista you can quickly access the internet, chat, play online games, use Skype, listen to music and manage (not edit) photos. 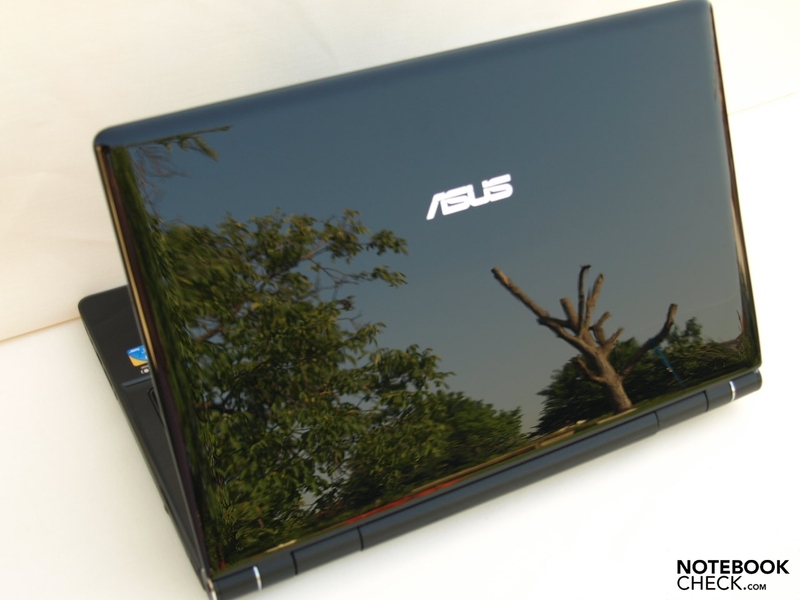 Asus grants a 24 month guarantee ex works. The keyboard uses a layout of individual keys and offers a separate number pad. The LED lights built into the individual keys provide a service to you when working in dim environments. By using a standard layout, mistake-free touch typing comes easily ad hoc. You also can't complain about the mechanical qualities of the keyboard. On the contrary, typing proves to be pleasant through the matte surfaces of the keys, a well-dimensioned stroke length and clear feedback. Furthermore the keys fortunately work comparatively quietly. You'll find no additional keys. 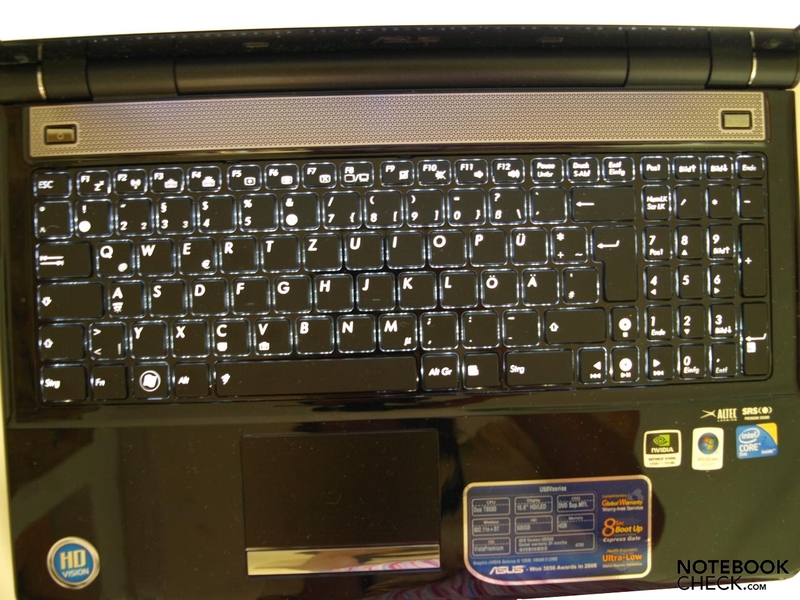 For this the Fn-key combinations with easily readable and clearly visible icons on the F-keys were marked. 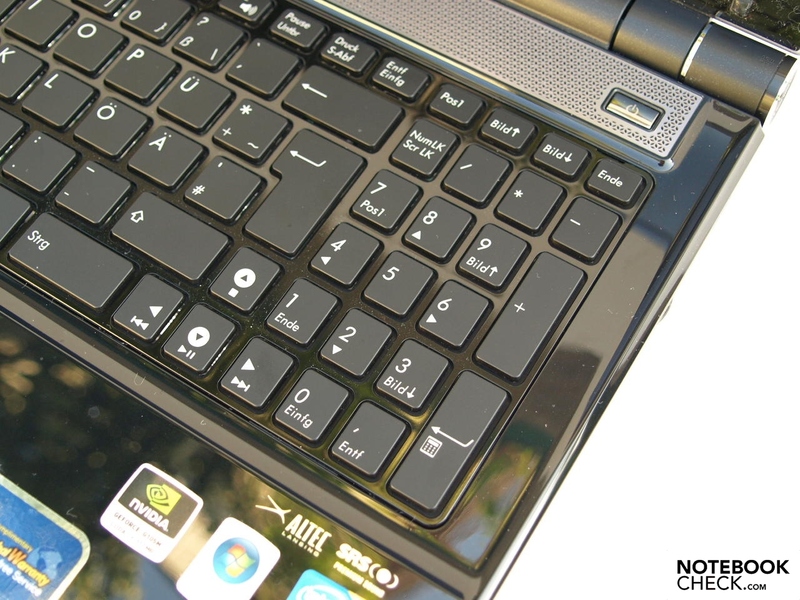 The touchpad had to be placed rather to the left due to the additional number pad. Relative to the main keyboard the position is thoroughly okay. If required it can easily be deactivated with Fn-F9. Also the matte surface of the pad allows precise steering of the cursor - indeed only with absolutely dry fingers. In summer navigating can however prove to be very tiresome. With slightly damp fingers the surface feels unpleasantly clammy. 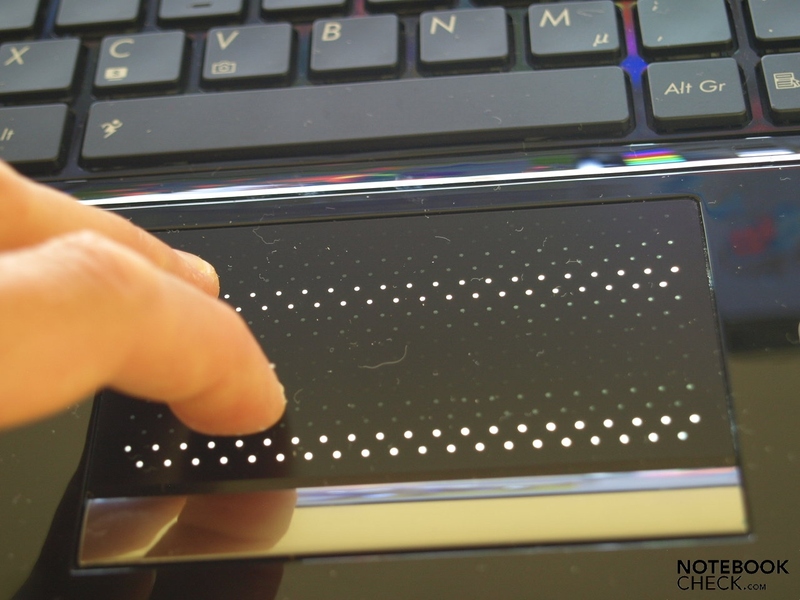 Indeed there is no specific scroll area, instead scrolling is possible on the whole touchpad surface by sweeping with two fingers over the touchpad. 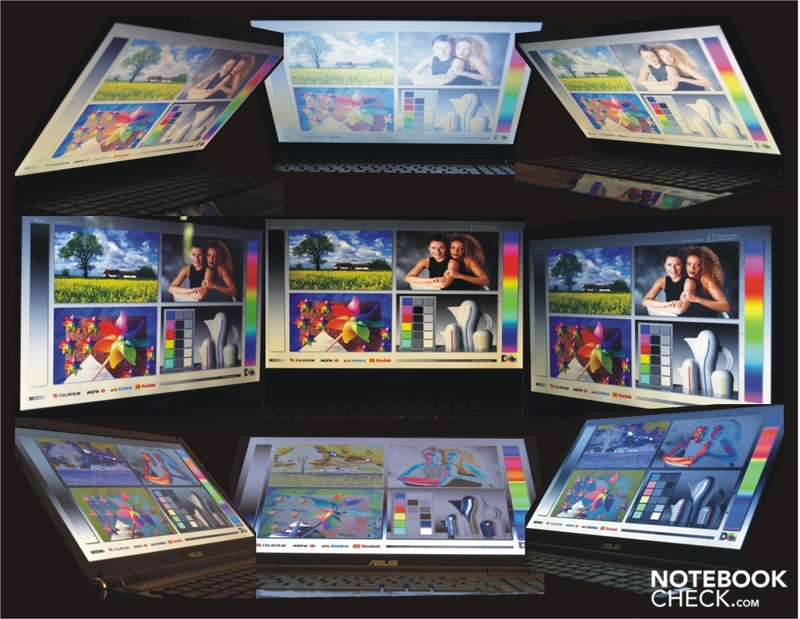 Other multi-touch features, which are all configurable with the drivers, comprise for example enlarging and minimizing through moving two fingers apart or together. 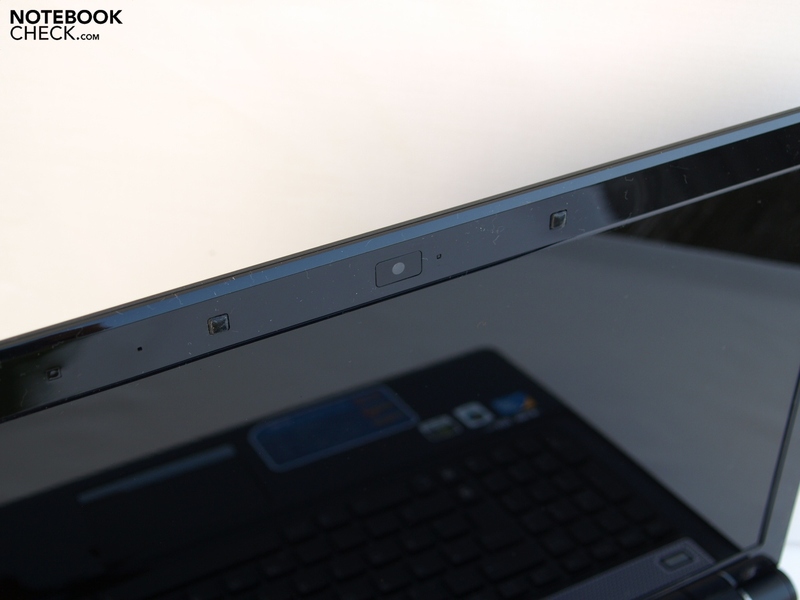 The feel of the touchpad keys designed as individual keys in silver high-gloss is not necessarily optimal. The key itself only slightly responds in the border areas. In contrast in the middle there is a relatively large dead zone. 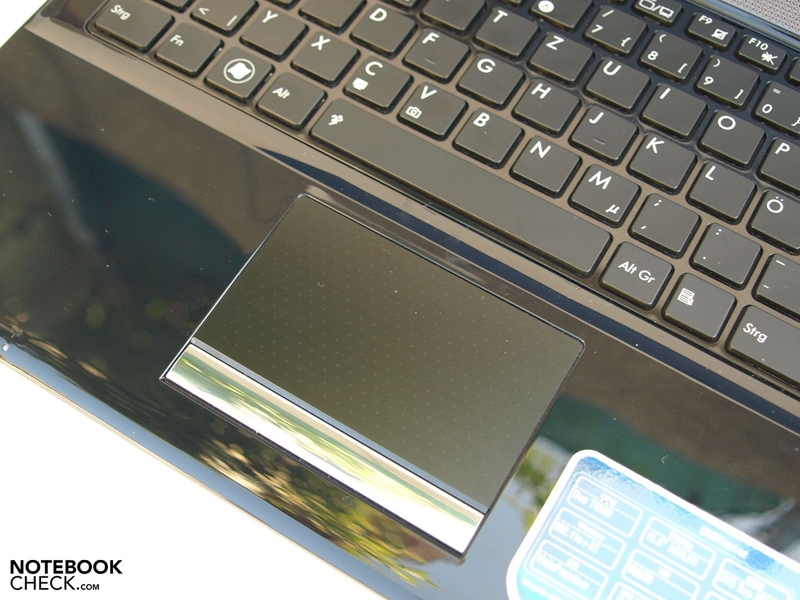 A further characteristic of the touchpad is the cool illumination when turning on the notebook as well as sweeping the fingers over it. The 16-inch display in cinema-friendly 16:9 format has an HD resolution of 1366x768 pixels. 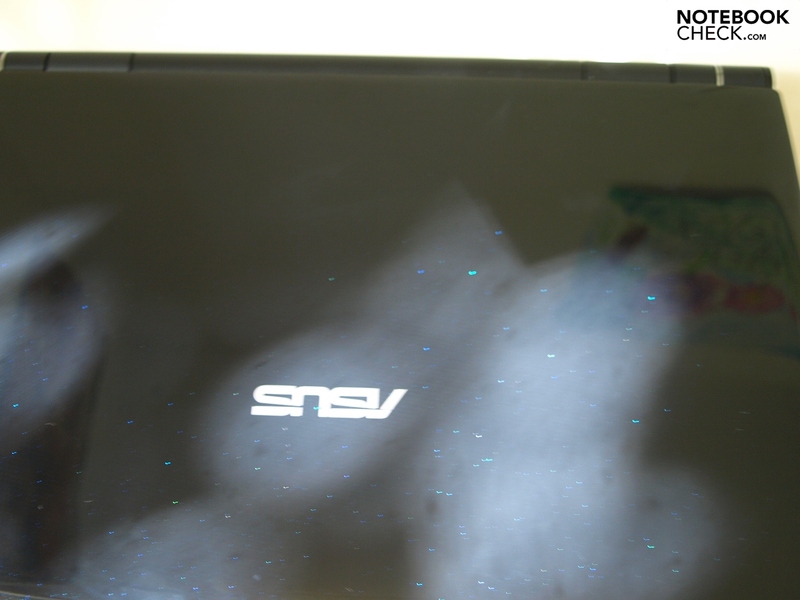 As Asus has unfortunately chosen a high-gloss silvering (glare type), it actually reflects very strongly from marginal exposure to the sun's rays. In this way relevant dimming should always be arranged for films. As expected the U50Vg is in no way suited for outdoor use through the reflective display. Outside of buildings you can recognise almost nothing more and the eyes become encumbered. A usable feature is the Ambient Light Sensor, where the display brightness automatically adjusts itself to suit the surrounding light. This can be activated and deactivated easily via FN-A. Also the measurement values of the display aren't outstandingly good. The maximum brightness of 201 cd/m² measured in the central area is still okay, yet for a display with LED background lighting this is comparatively low. Furthermore the brightness drops off quite strongly to the edges. In the left lower corner only 157.7 cd/m² was measured. Overall it arises as a less than consistently illuminated panel with illumination of only 78%. The maximum brightness in the central image segment yields a mathematical contrast ratio of 195:1 together with a black value in that very place of 1.03 cd/m². Also the viewing angle stability of the U50Vg is ranked in the middle field among the competition. Horizontally the field is extensively large, whereby you have to deal with disturbing reflections when flattening the viewing angle. However it ends up much more quickly in image alterations in the vertical field, like shading or respectively image alterations when looking from below or over-shining when looking from above. 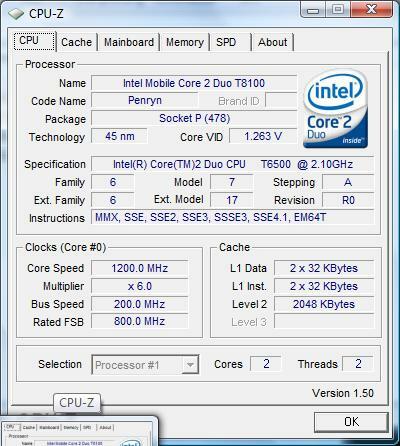 Our test device is equipped with an Intel Core 2 Duo T6500 processor (2M Cache, 2.10 GHz, 800 MHz FSB). Thereby it's about a Penryn processor manufactured in the 45 nm process with a maximum Thermal Design Power (TDP) of 35 Watt. 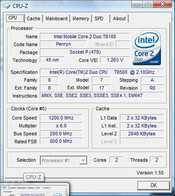 According to the manufacturer other CPUs of the Intel Core 2 Duo range are available (T9550/T9400/P8700/P8600/P7350/T6600/T6500/T6400/T5900/T5850 with clock speeds between 2.66 GHz and 2.16 GHz) and on the lower performance spectrum there's also an Intel Pentium M T4200 processor at 2.0 GHz. 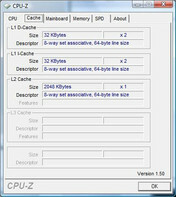 Note about the following screenshots: The CPU-Z Tool misleadingly indicates a Core 2 Duo T8100 CPU. 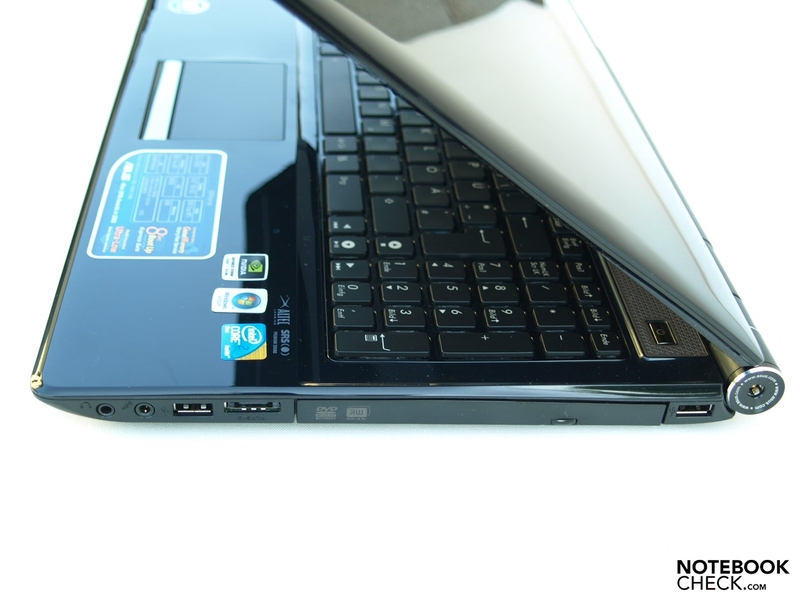 The Everest Report likewise wrongly indicates a Core 2 Duo T6570. According to the benchmarks it's a matter of a Core 2 Duo T6500 CPU, as you can read off the sticker on the left palm rest. 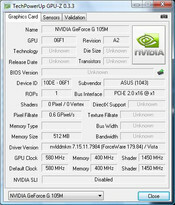 For pixel calculations the Nvidia Geforce G 105M entry-level graphics card is appropriate. The graphics card, manufactured in the 65 nm process, supports Direct X 10.0, yet it is not adequately strong enough to be able to play modern 3D-heavy games really fluently with more than minimum details and at the lowest resolution. 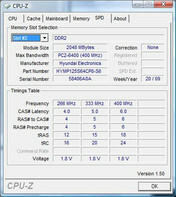 With four Gigabytes of main memory the U50Vg offers the maximum RAM capacity that a 32-bit operating system can address. Due to the special qualities of the Intel architecture and the reservation of memory for Memory Mapped IO and the operating system however only around 3 Gigabytes are available. 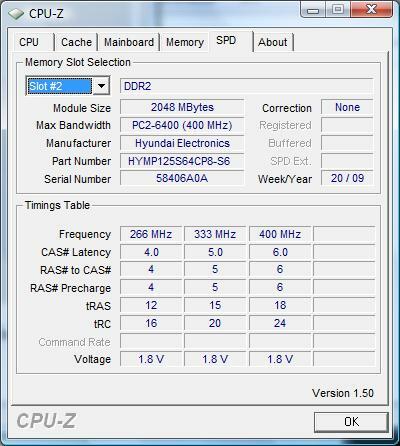 Theoretically the PM45 Express chipset can support up to eight Gigabytes of main memory. Yet when upgrading memory at least one of the built-in modules becomes obsolete and furthermore the installation of a 64-Bit operating system becomes due. 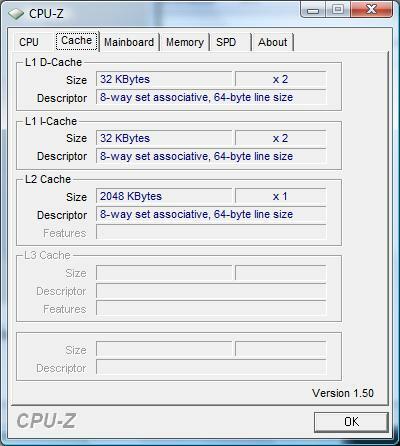 Before this step you should in any case check whether 64-bit drivers exist for the potentially available peripheral devices. 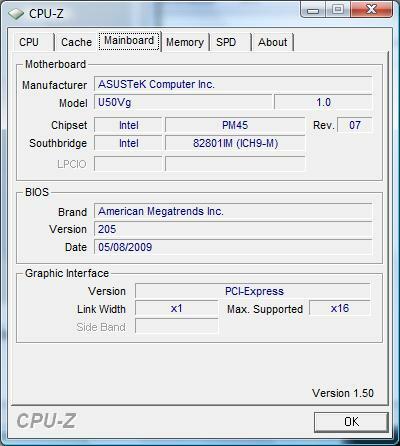 Asus indeed offers the U50Vg only with a maximum of four Gigabytes of main memory. Also the hard drive contributes to the performance of the entire system. In the test candidate a Seagate ST9500325AS with 500 Gigabytes gross capacity was built-in. 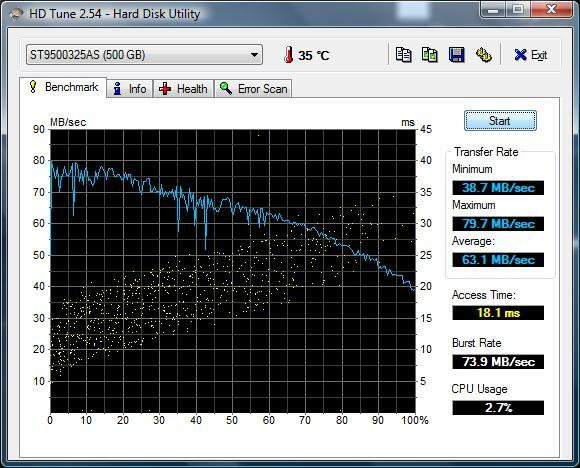 With a rotation speed of 7200 rpm this reaches a relevant value in the HDDTune test: on average the transfer rate averages 63.1 Megabytes per second. The access time adds up to 18.1 ms. There are also smaller hard drives to choose from: 320 GB, 250 GB. 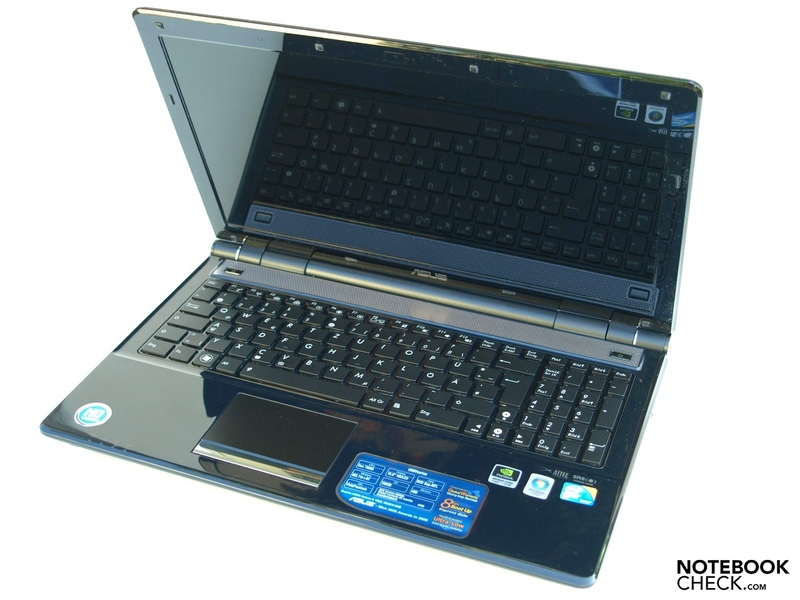 Regarding the built-in optical drive it concerns a DVD-Super-Multi-Drive, a Matshita DVD-RAM UJ-862AS. In order to be able to assess the application performance, PCMark Vantage came into play. This provided a good result with 3148 points overall. We resorted to 3DMark for the synthetic game benchmarks. 3DMark Vantage unfortunately provided no result. 3DMark05 certified the Nvidia Geforce G105 M with a result comparable to the ATI Mobility Radeon HD 3430 (in the HP Compaq 6830s). The Geforce 9300M GS from Nvidia likewise shows similar benchmark results. The shading results of the Cinebench R10 tests yielded similar results. 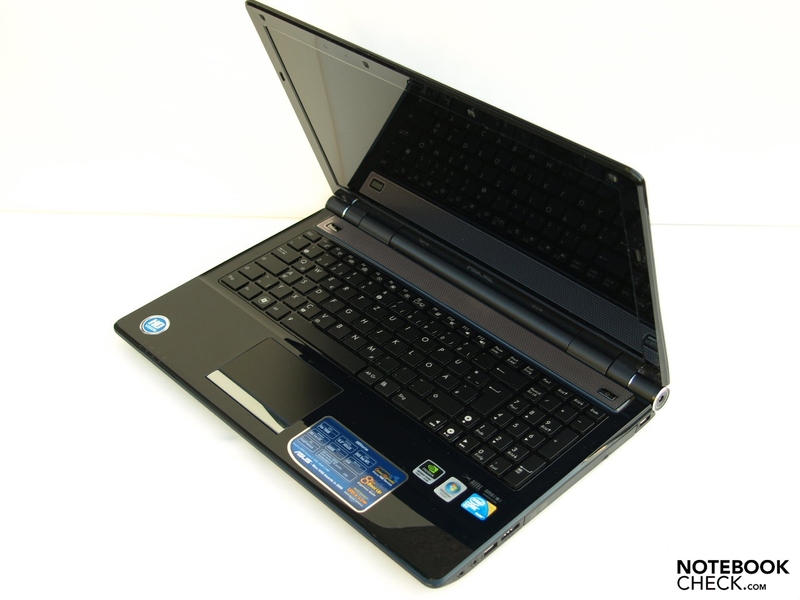 Here results were delivered that are comparable to the Asus M51Se with ATI Mobility Radeon HD 3470. 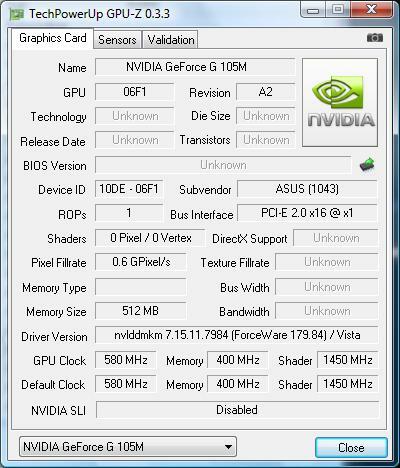 Indeed the Geforce G 105M isn't aimed at high 3D performance. Nevertheless the extent to which this graphics card can tackle modern games has interested us. As expected, these are only fluently playable at a low resolution and low details. Independent of load the noise emissions of the U50Vgs remain constantly in the background, which is subjectively pleasant. This is also confirmed through the measured values. 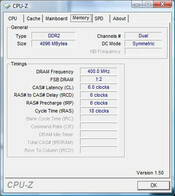 At a maximum 32.9 dB(A) in idle mode or in use with low load it is a relatively quiet device. 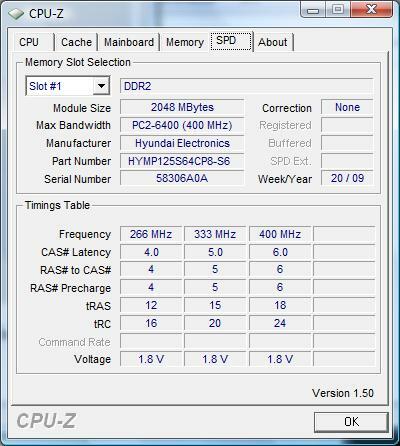 Under load only then is a fan noise at a maximum of 40.5 dB(A) possible. 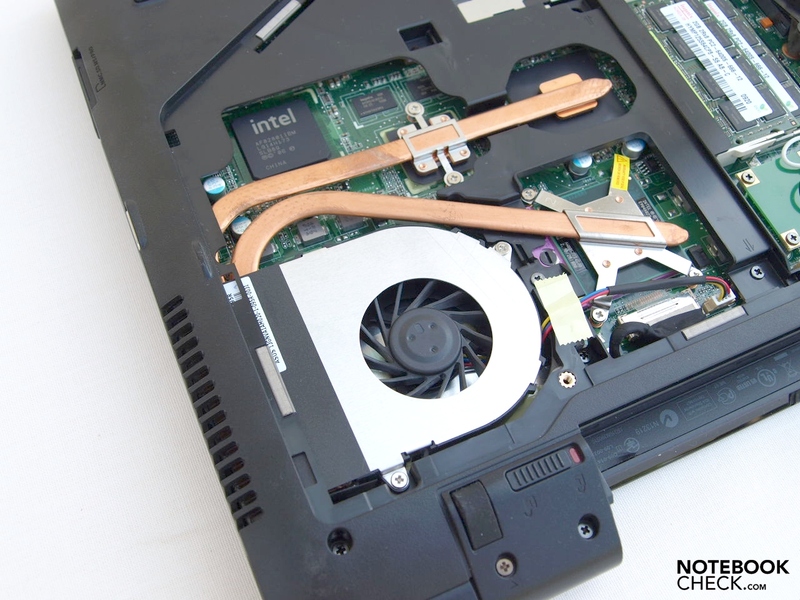 The hard drive noise and the optical drive during DVD playback also stay in limits. Only when transferring data the latter becomes somewhat louder from time to time at 46.4 dB(A). But it's not only the noise emissions that are convincing. Because of the measured temperature development the U50Vg also belongs to the pleasantly temperate class of devices. Both of the palm rests and the keyboard area remain cool. On the upper side a maximum of 36.4 degrees Celsius was recorded (so body temperature) in the left upper segment. On average it's only 32.2 degrees Celsius. The underside is on average even cooler than the upper side at just 30.5 degrees Celsius. The maximum value of 36.8 degrees Celsius was measured, however, on the underside. For this reason as only body temperature is reached, use on the thighs doesn't really stand in the way. (+) The maximum temperature on the upper side is 36.4 °C / 98 F, compared to the average of 36.5 °C / 98 F, ranging from 21.1 to 71 °C for the class Multimedia. A sound system from Altec Lansing is built into the U50Vg. Both of the loudspeakers are situated above the keyboard below the silver cover. The maximum volume proved to be rather low. However the feel of the sound is usable on the whole, if you also desire strong bass every now and then. The sound over the 3.5 mm headphone jack has no abnormalities. According to the manufacturer S/PDIF can also be used. 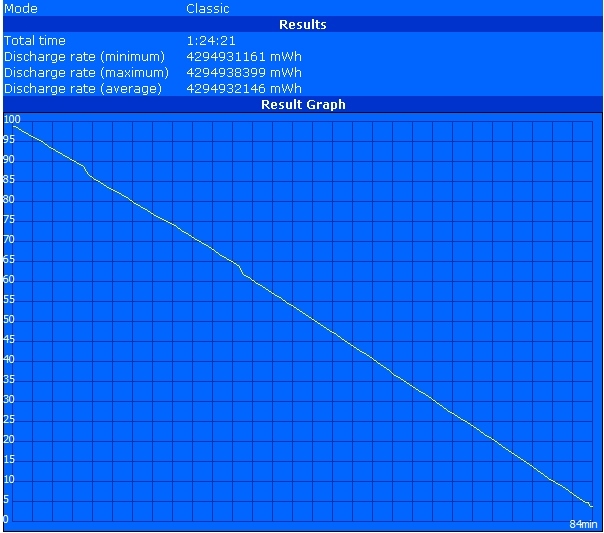 When it comes to battery a 6-cell Lithium ion model with 47 WH (10.8 Volt, 4400 mAh) comes into play. For this reason the U50Vg reaches quite good battery running times. A minimum of one hour 24 minutes (84 minutes) is possible, measured with the Classic Test of BatteryEater Tools with Power4Gear high performance profile, maximum brightness and wireless on. 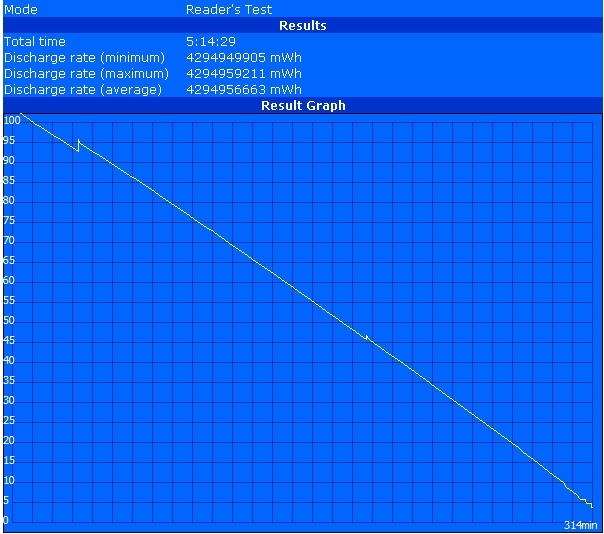 The values in practise will lie between this and that of the Reader's Test (likewise BatteryEater Tool) with Power4Gear energy saving profile, minimum brightness and deactivated WiFi modules, with a minimum time away from the power supply of five hours 14 minutes (314 minutes). In the practical WLAN test with Power4Gear entertainment profile and good brightness we could work running from the battery without interruption for around two hours 33 minutes (153 minutes). It only looks marginally worse from DVD playback. At two hours 21 minutes (141 minutes), it can in any case easily achieve an average feature-length Hollywood film of 90 minutes. In order to save energy, you could possibly resort to a Core 2 Duo Pxxx CPUo of the Penryn range. 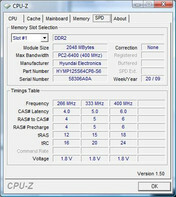 Intel Core 2 Duo Pxxx CPUs clocked at the same speed provide the same performance, yet at a lower 25 Watt. For this reason the battery life could be lengthened. Indeed the U50Vg doesn't quite approach the image of the "wings of a butterfly". Nevertheless it seems lighter than it really is due to the design. The relatively robust case seems rather neutral with its subtle black-silver combination. Comfortable number input is possible through a separate number pad. Also the main keyboard in its layout with separate keys invites typing longer texts. The touchpad wasn't as pleasing, whereby navigating during a hot season can become tiresome potentially due to wet fingers. 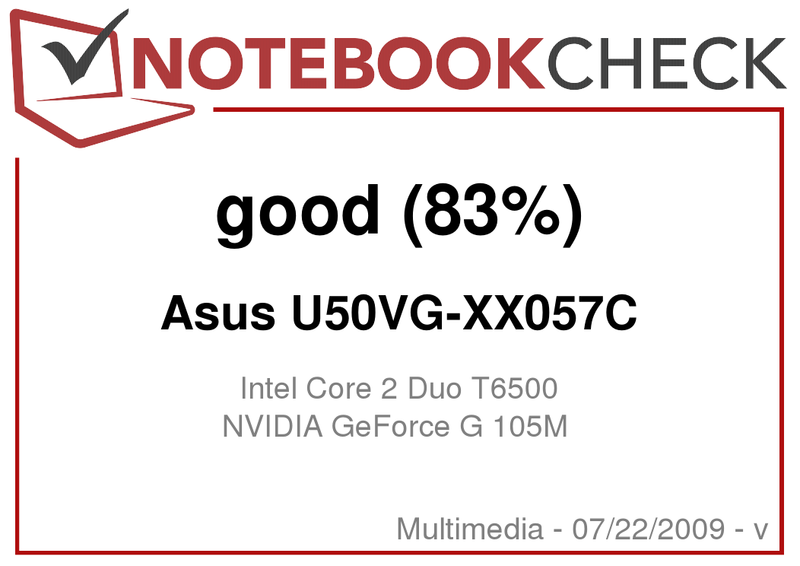 Regarding performance and energy consumption the U50Vg from Asus is well-balanced. Neither is it extremely well-performing nor are there extreme battery running times inside. For office work and not-too-demanding multimedia fare it actually has adequate power. 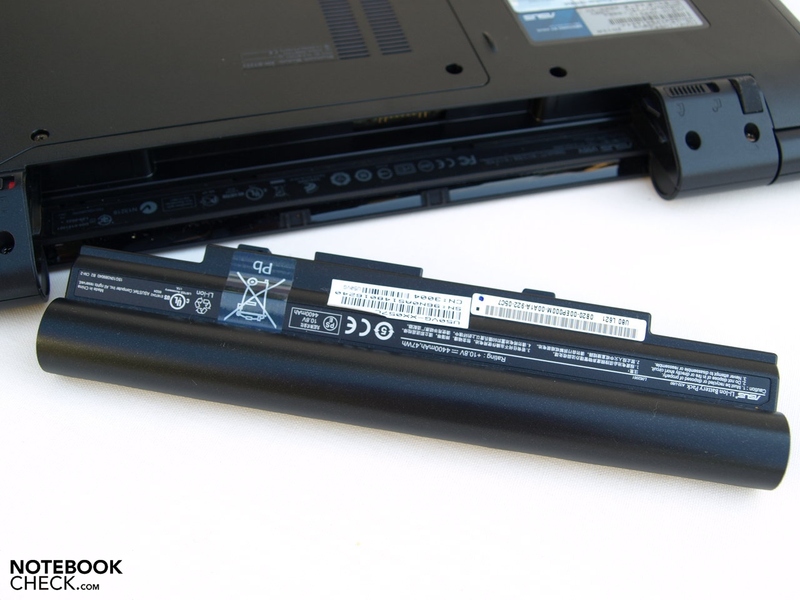 Due to the battery life depending on load temporary mobile work is more or less possible. You'll certainly have less joy with the reflective, glare-type display. 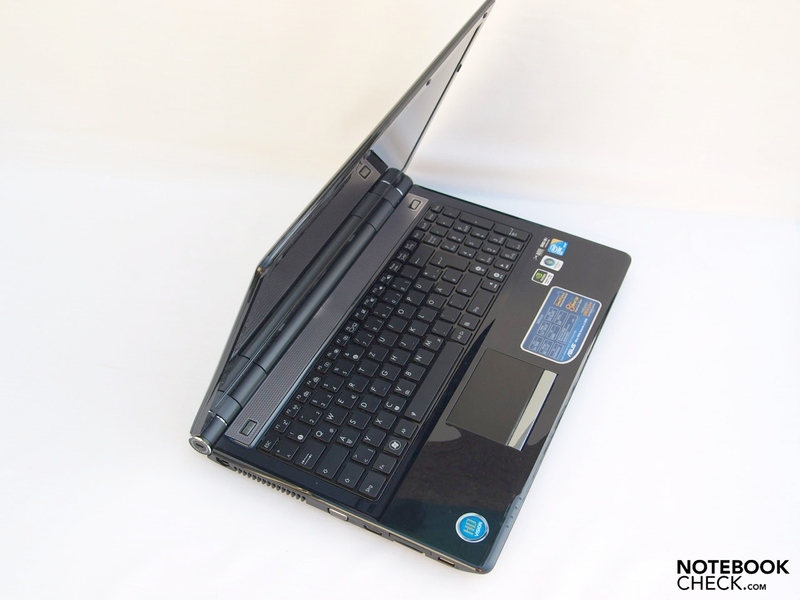 Anybody that can live with a somewhat limited mobility will find a solid multimedia notebook of the entry-level sector with a good price/performance ratio in the Asus U50Vg. HD Ready with an HDMI interface. Good application performance and adequate multimedia performance for not-too-demanding 3D applications with Core 2 Duo CPU, Nvidia Geforce G 105M and 4 GB RAM. For a RAM upgrade a 64-Bit operating system is due. Large 500 GB hard drive with good performance data. Optionally there are smaller ones. The components warm up the case not too strongly. 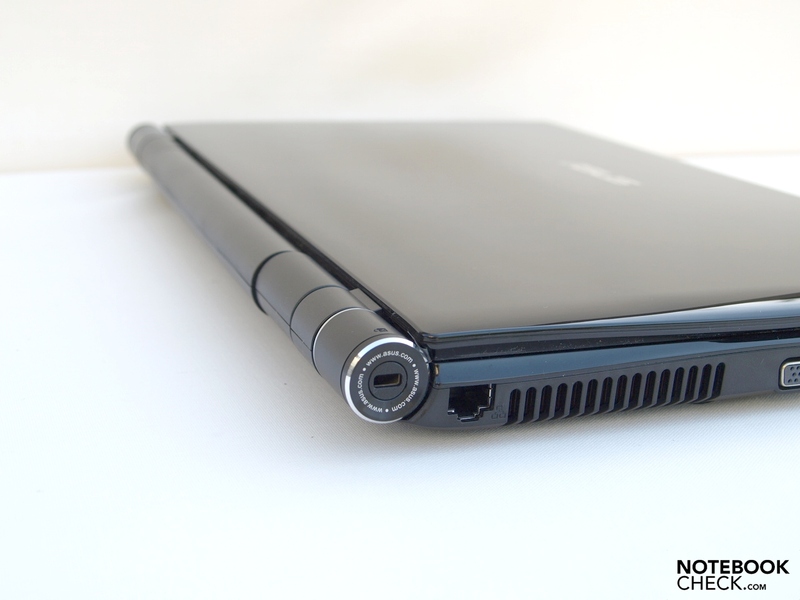 In addition the Asus U50Vg stays mostly pleasantly quiet. The Altec Lansing loudspeakers are somewhat quiet at maximum volume. The 6-cell battery offers a usable, if not outstanding running time. The touchpad, however, shows weaknesses. Typing proves to be pleasant. 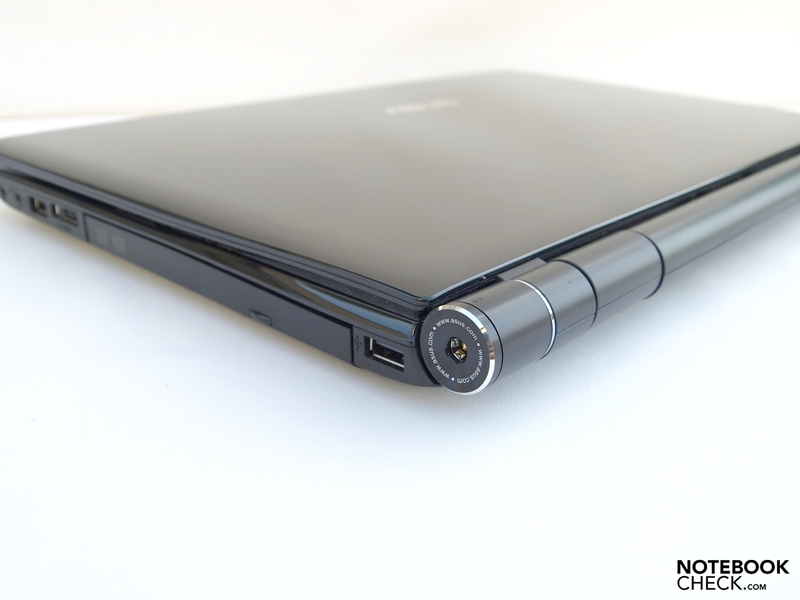 With a 1.3 MP Webcam the U50Vg is primed for internet telephony. On the right the power button boots the operating system. Pre-installed is Windows Vista Home Premium 32-Bit. 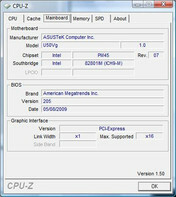 On the left the button for the Asus Express Gate is situated (instant-on operating system). For this reason you can surf the internet, chat, use Skype, manage photos and listen to music. In the middle to the front area the interfaces are inconvenient when permanently occupied for left-handed people. Also the arrangement of ports is not optimal for right-handed people. Two USB interfaces next to each other are also not at hand, instead there is eSATA. 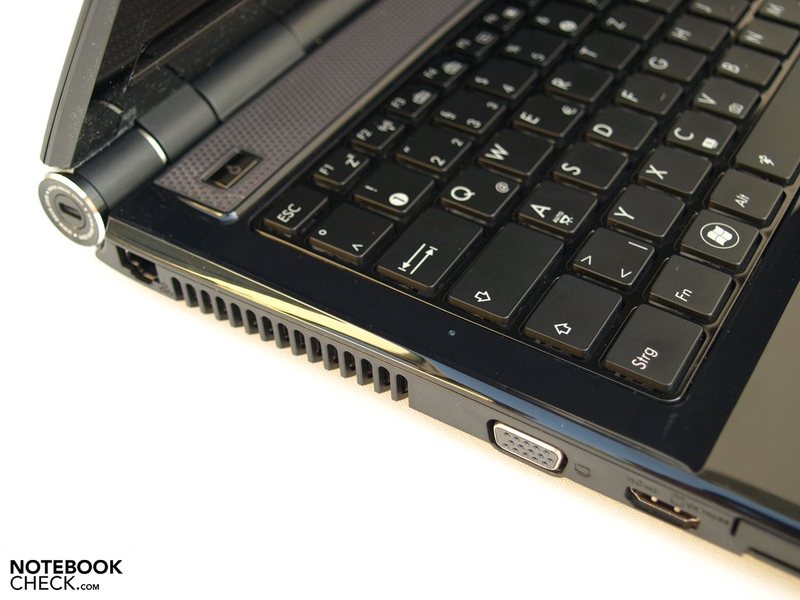 With a wide USB stick the DVD drive can no longer be opened. The solid office performance, and the relatively appealing battery life will certainly cause no waves of excitement, yet they are thoroughly pleasing for the price class. A matte display variant would be fine at least as an option. How hot black surfaces can become when used on summer days in the sun. 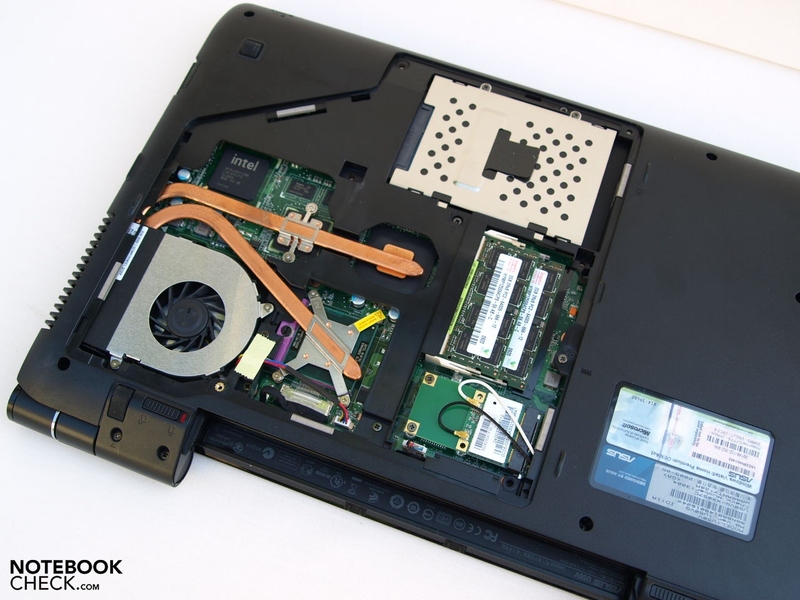 15-inch multimedia notebooks in the low-price entry-level region would be the Acer Aspire 5536G or the HP Pavilion dv6 already tested by us.